The subtitle for this article could very well be: In Defense of DinoLand U.S.A. Quite simply, DinoLand U.S.A. gets a lot of flak from a lot different people and it is my personal opinion that a great deal of it is undeserved. Over the holiday season I watch one of my old standbys, Jurassic Park, and it got me to thinking about DinoLand quite a bit. Yes, I am fully aware that there is a Jurassic Park land just down the road in Orlando. And yes, I do have strong ideas on how good it is or isn’t and what could be done to make it as exciting as Isla Nublar itself. But we’re not talking about Jurassic Park and I think that is where most people get confused on what is happening in DinoLand U.S.A. it was not built to serve as Disney’s version of Jurassic Park, there are plenty of dinosaurs and tales to be told about them, outside of the zoological park designed in the mind of Michael Crichton. If anything, DinoLand U.S.A. served as the port of entry into the world of Dinosaur, the 2000 computer animated feature from Disney Animation. 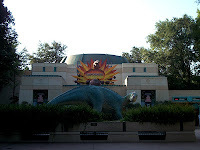 The main character, Aladar, is seen in sculpture form in front of Dinosaur, the attraction not the movie, is conceivably the same Iguanodon that save guests in their Time Rover, and could be seen frolicking river side on the Discovery River Boats once upon a time. 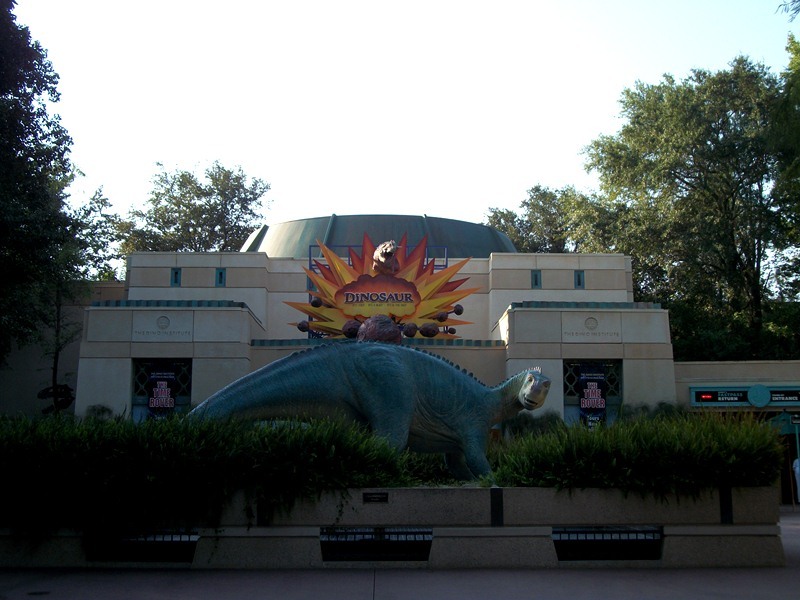 It is only fair that I mention that the attraction Dinosaur was originally named Countdown to Extinction, the name change took effect in 2000 as part of the push for the movie Dinosaur, and that a Styracosaurus sculpture originally inhabited the spot now belonging to Aladar. While the movie did not do incredibly well, this wouldn’t be the first time that Disney built up an area or attraction dedicated to a not so beloved or popular film and have that area work out just fine. All of the Aladar and Dinosaur elements aside, what is the true story of DinoLand U.S.A.? It’s pretty simple actually. It is a small town in Florida known for its fishing. The town has a gas station, easy access to the river, and a fishing lodge turned restaurant, but not a single red light to be seen. While such towns are peppered all throughout Florida, I’m willing to bet you know of such a town in your area too. Then the miraculous happened, dinosaur fossils were found in the area. A research organization took over the restaurant and transformed it into a museum and the proprietors of the gas station decided to turn their place into a sideshow for the tourists that would soon be coming through. Eventually, the research fellows outgrew the restaurant, built a shiny new facility, and turned the lodge/restaurant/museum over to the interns. Meanwhile, just down the road, the excavation site grew bigger and bigger with each extraordinary find! That may seem like a whopper of a fish story if you’ve ever heard it, but it is the truth behind the going-ons of DinoLand U.S.A. The brilliant part of the story is that every single part of the story is there for you to uncover on your own. You don’t need me to tell you what’s happened here, you just have to look around. Restaurantosaurus has clues to its past and present everywhere, from exhibits and newspaper clippings right on down to the personal belongings of the interns who live there. Dinosaur features classic museum displays of The Dino Institute and the groundbreaking work taking place in its research facilities, not to mention the bits of found in newspaper articles pinned to bulletin boards all throughout the land. Chester and Hester’s was clearly once a gas station and their carnival sideshow sits on an old parking lot. The Boneyard, well, that should really speak for itself, shouldn’t it? The point is, the story is everywhere, if you are willing to take the time to process what you are looking at, and maybe dig a little deeper. With all of that story being relayed in a variety of ways and a top-tier attraction to boot, why do people get so upset with DinoLand U.S.A.? It seems to me that most of the animosity directed at the land seems to have one point of emphasis, Chester and Hester’s Dino-Rama. The complaints run the spectrum and include guests having to pay for the games, cheap, off the rack attractions, and a copy of amusement alleys seen in regional theme parks. Guess what? The Frontierland Shootin’ Arcade costs a dollar, and there is no chance at winning a prize there, just a fun way to pass some time. 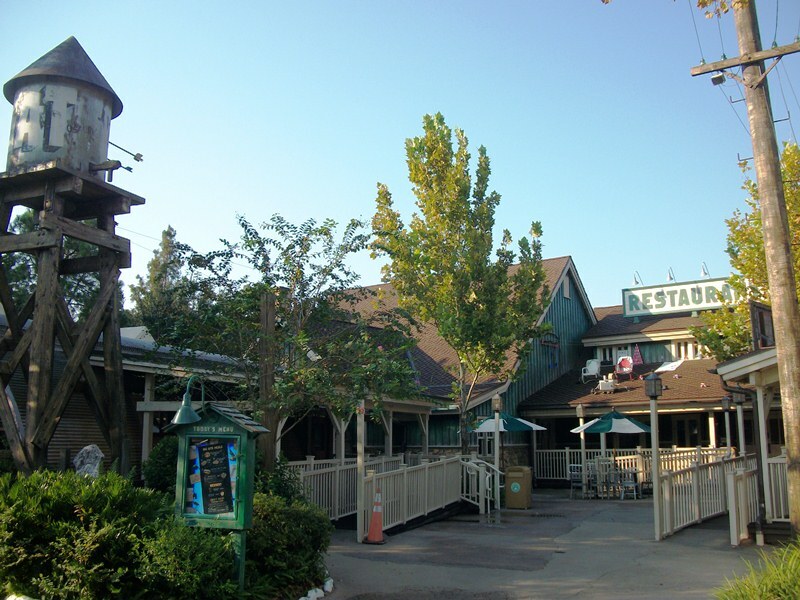 As for the off the rack attractions, this area is supposed to be run by a couple that own the gas station, they wouldn’t have unlimited funds to put together a top notch theme park. However, one attraction in this sub-land plays off of a Disney classic, TriceraTop Spin feels an awful lot like Dumbo The Flying Elephant to me, while the other feels like an Imagineering-amped version of a carnival coaster and not like a ride I would see passing through at any fair. Dino-Rama takes the idea of roadside attraction, slaps a ridiculous amount of layered details on it, and presents their take that I would argue could not be found at any roadside detour anywhere. 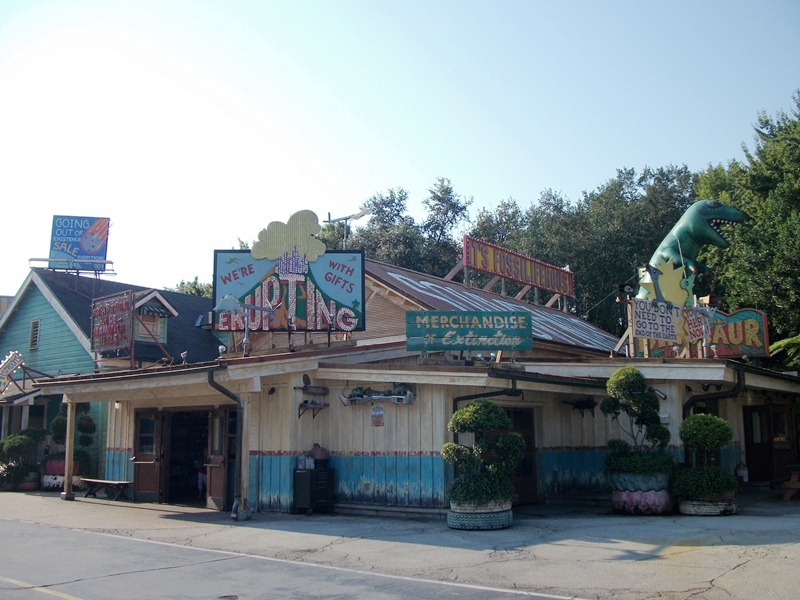 Are all of the attractions in DinoLand U.S.A. E-Ticket caliber? Of course not, that isn’t the way to create a world class park, you have to have a variety of attractions and engaging elements. The story of DinoLand U.S.A., however, is on par with some of the finest works Imagineering has ever done. It may take a while to understand all that the land has to offer, but it is so incredibly worth the investment of time. The biggest hurdle DinoLand U.S.A. may have to conquer in order to entirely change the minds of the average Walt Disney World guest is the preconceived notions they have of what a dinosaur land should look like due to their dreams of a Disney version of Jurassic Park. 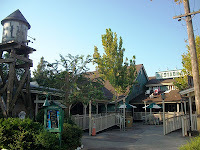 While trying to pursue the educational angle, which itself is the opposite side of the dinosaur adventure/Jurassic Park avenue, Disney has given the land its own unique voice, just not the one guests were hoping to see. DinoLand U.S.A. is not bad. Heck, it’s not even designed that way. It stands on its own, highlighting an extinct group of animals in a park crawling with real world denizens from every corner of the globe, and its does so in an informative and fun manner. There are a plethora of stories to be found within its borders, and I don’t simply mean the stories told through the attractions, and a level of detail seldom seen in a park outside of Walt Disney World. DinoLand U.S.A. puts its best foot forward each and every day, and it is up to us as guests as to whether or not we can accept such an incredible work of imagination and fact. Well said! All of Animal Kingdom is teeming with detail, and Dinoland's detail is so purposefully cheap and schticky it's actually quite hilarious. And yet, the same people crowd Toy Story Midway Mania, which is based on similar themes. I've always loved Dinoland USA and when Chester and Hester opened up Dino-Rama, I found the Imagineering behind it quite tongue and cheek. The fact that Primeval Whirl is Chester and Hesters version of Dinosaur is quite funny. The whole sub-land also adds some much needed kinetics to Animal Kingdom. I've always found it quite entertaining and when it comes to Primeval Whirl, my daughter and I laugh our heads off, each and every time we ride it. I'm glad there are so many people backing up DinoLand U.S.A. as a quality place to spend time in Disney's Animal Kingdom!